"Muscular spasms, pain, muscle strain, overwork, sports injuries, stress, anxiety; back, neck, shoulder, or joint aches; recommended to be used with body-work for backache; early onset of bronchial restrictions and asthma attack," from Rosita Arvigo's Ethnobotany of Belize. Great for the hard working individual. This tonic will ease back and neck ache, muscle spasms, and athletic strain. It also can halt the onset of asthma. Use preventatively and topically. ​Please contact me for specific dosage information if you are considering taking this tincture for yourself or your loved ones. I am happy to help you in a Free 15-minute Consultation. *Not to be taken during pregnancy or while nursing. Also avoid if on antidepressants. Children over the age of 7 can use this tincture. Strong Back, Wild Yam, and Man Vine. 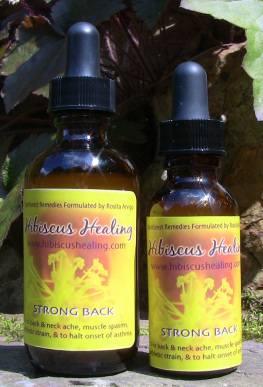 Check out the Blog Post for more information on Strong Back Formula for Back Pain & Asthma.